Osmos has a wide variety of different level types, which all revolve around one common theme: Be the biggest. You control a tiny organism called a “mote". By tapping in a direction, you expel mass towards where you tapped, and your mote goes zooming off the other direction. With each tap you lose a little bit of your mass, so it doesn’t take long before you’re making extremely calculated taps to get exactly where you want to go with minimal loss of size. Your mote can absorb any mote that it smaller than it, but it also can be absorbed by any mote that is larger than it. You can also zoom in or out using a pinching gesture. Initially levels simply ask you to be the biggest, but it doesn’t take long until Osmos throws other level types at you such as levels where everything is orbiting around a central mass and you must carefully expel your own mass to change your orbit to absorb other motes as well as levels that require you to capture a specific mote. In all, eight different levels types are included, which all have their own unique mechanic centralized around the physics engine powering Osmos. You can even speed up or slow down time by swiping the screen, a function that becomes very handy in later levels when you need time for precise movements. Following the completion of Odyssey mode, arcade mode is unlocked which allows you to play any level type on whatever difficulty level you choose. OpenFeint is even bundled in for tracking the various in-game achievements. 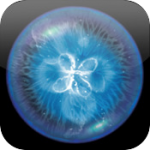 The iPhone version of Osmos includes support for fast app switching and the iPhone 4’s Retina Display. The graphics look phenomenal on the iPhone 4, with razor sharp text and extremely crisp in game graphics. Some of the levels have been adjusted for the iPhone screen and create a somewhat different and slightly more difficult experience. If you don’t own an iPad and have been curious about Osmos, now is your chance to get in on the fun. The game has received a ridiculous amount of praise for both the Mac/PC and iPad versions, and this new iPhone edition is no different. This is one of those games that must really be experienced by everyone, and can now be enjoyed by iPad and iPhone owners alike.